"Baking with this mix is all fun and no fuss. Give it in a big jar, with the recipe, baking sheets, parchment paper, a metal rack and oven mitts as a special gift, at Christmas, Easter, housewarming or any time. Especially effective when young students are just moving away from home for the first time." In a large bowl combine oats, flour, brown sugar, cinnamon, baking powder, baking soda and salt. With a pastry blender cut in shortening until crumbly. Stir in raisins, coconut, chocolate chips and pecans. Refrigerate in an airtight container for up to 10 weeks. Attach a tag that reads: Preheat the oven to 375 degrees F (190 degrees C). Grease a baking sheet, or line with parchment paper. Measure 4 cups of the mix into a large bowl. Whisk together 1 egg, 2 tablespoons milk and 2 teaspoons vanilla; stir into the mix. Roll into 1 1/2 inch balls and place on prepared baking sheet. Flatten with a fork dipped in sugar. Bake in preheated oven for 15 to 18 minutes, or until golden. Allow cookies to cool on baking sheet for 5 minutes before removing to a wire rack to cool completely. 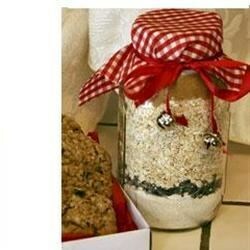 Great recipe, needs to be cut down for quart jars.